MI6 Competition: MI6 has partnered with Corgi to offer lucky readers the opportunity to win die-cast Silver Goldfinger 50th Anniversary Aston Martin DB5s. The Corgi Aston Martin DB5 was first released in October 1965, almost a year after the DB5 made it's on-screen debut in Goldfinger (1964). The car was certainly popular in its day, selling over 6,000,000 models. It also received the first ever 'Toy of the Year' award. 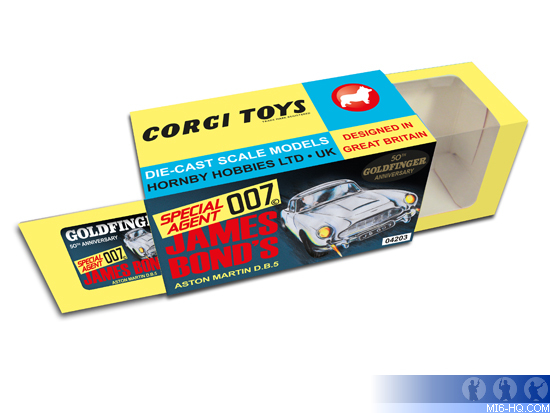 In the wake of the classic Goldfinger film, starring Sean Connery as British agent, James Bond, Corgi began its decades-long relationship with the Bond franchise producing many different models, including a gold Aston Martin DB5 1:46 scale model complete with retractable machine guns, ejector seat and rear bullet screen. Which gadget does the secret red button on the DB5's gearstick invoke? TERMS & CONDITIONS: THE COMPETITION CLOSES AT MIDNIGHT GMT ON 20TH AUGUST 2015. MI6 WILL CHOOSE THE WINNERS AT RANDOM FROM THE CORRECT ANSWERS RECEIVED. THE WINNERS WILL BE CONTACTED VIA THE EMAIL ADDRESS SUPPLIED AND THEIR POSTAL ADDRESS WILL BE REQUESTED. IF A WINNER FAILS TO RESPOND WITHIN 7 DAYS OF PRIZE NOTIFICATION, ANOTHER WINNER WILL BE CHOSEN UNTIL ALL PRIZES ARE ALLOTTED. COMPETITION IS OPEN TO MI6 READERS WORLDWIDE. ENTRANTS MUST BE AT LEAST 13 YEARS OF AGE.